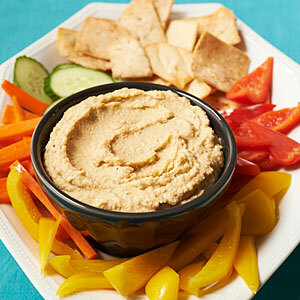 Hummus is a great addition to any meal but it is also the perfect snack to combine with any vegetable that you choose. Great source of fiber and other health benefits and you can combine up to fill you up but not break down your diet. -Place beans and garlic in a food processor; pulse 5 times or until chopped. Add 1/2 cup water and remaining ingredients; pulse until smooth, scraping down sides as needed. -Add other ingredients from list to paste as needed.